GoldandSilverNow, the online bullion dealer founded by former Apprentice-star Tarek Saab, has teamed up with Michigan-based manufacturer, The Lydian Mint, to offer the first quarter ounce .999 fine silver coin in the precious metals market. The introduction of this coin comes in response to heavy consumer demand for silver bullion in small, tradable denominations. "A major focus of The Lydian Mint will be to provide investors with fractional bullion coins in both gold and silver," said a press representative for The Lydian Mint. "Offering fractional silver coinage with .999 pure silver content provides a superior opportunity for investors whose only other option has been traditional "junk" bags of circulated coins, which carry high premiums and only 40% or 90% purity." David Morgan, world-renowned silver expert and author of the popular monthly newsletter "The Morgan Report" (www.silver-investor.com), is excited about the new entry into the silver marketplace. "This is the first fractional silver coin to arrive in modern times… and what a beauty! This 0.25 troy ounce anticipates a dramatic increase in the price of silver as myself and others have predicted over the ensuing years. This coin is long overdue, and I personally wish The Lydian Mint every success." GoldandSilverNow, which launched in November of 2008, has become a highly-trafficked bullion website with over 10,000 unique visitors per month. The company has developed a patent-pending trading process for buyers and sellers. It will serve as the official distributor for the Lydian Mint portfolio. "We believe GoldandSilverNow represents the future of online buying and selling of gold and silver bullion," said The Lydian Mint rep. "Their business is safe, reliable, and their customer satisfaction rating is fantastic. We believe a partnership with GSN will also assist us with educating the general public about how gold and silver can help people retain purchasing power in uncertain economic conditions." Adds David Morgan: " Tarek Saab has begun something that many of my friends and associates have talked about for years." 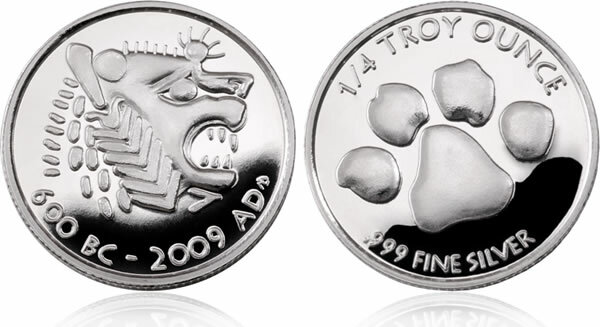 The fractional, quarter ounce Lydian Mint coin is a replica of the world’s earliest coin, known as "The Lydian Lion," minted around 600 BC in Lydia, Asia Minor. Each coin contains the year of mintage, purity, and a unique Lydian Mint mark on the obverse side of the coin. The Lydian Mint has plans to release fractional gold coins in March of 2009. For additional information, contact GoldandSilverNow at 1-888-484-8289 or visit www.GoldandSilverNow.com. 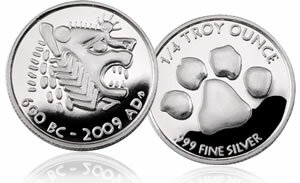 The Lydian Lion silver bullion coin is absolutely the most beautiful piece of silver in my collections. If you plan on buying 100 or more, you can order directly from the Lydian mint for a volume discount. Lydian Mint has great customer service, and got my order out in less than 2 weeks. Lydian mint does have certain order minimums, so for smaller orders, talk to a trusted bullion dealer.